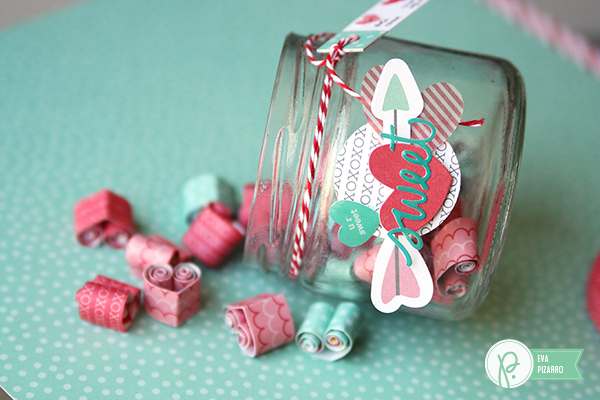 January 2015 - Pebbles, Inc.
Hello Pebbles Fans, Holly here from Ribbons & Glue. February is only a few days away now which means it’s almost Valentine’s Day. 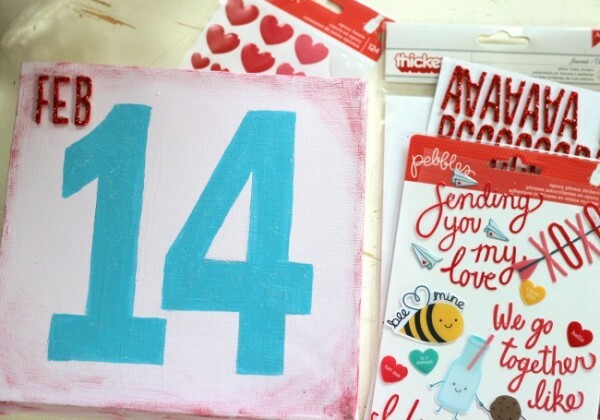 Valentine’s crafts are some of my favorite crafts to make. Every year, I tend to add a few home decor pieces to my Valentine’s collection. 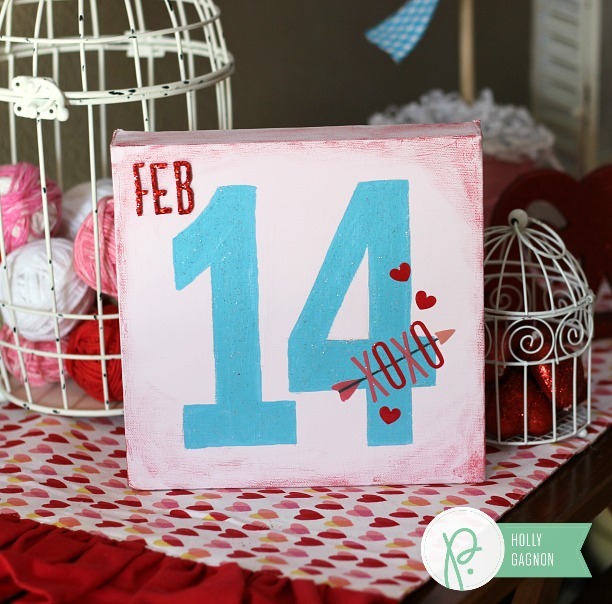 This year I embellished a painted Valentine’s Canvas with epoxy stickers from the Pebbles Inc. We Go Together collection. To make this Valentine’s Canvas, I painted an 8 x 8 canvas with chalky finish paints, then used my Silhouette to cut out a stencil to trace out the #14. After my paints were dry, I embellished the canvas with We Go Together epoxy heart and phrase stickers and red glitter foam stickers. 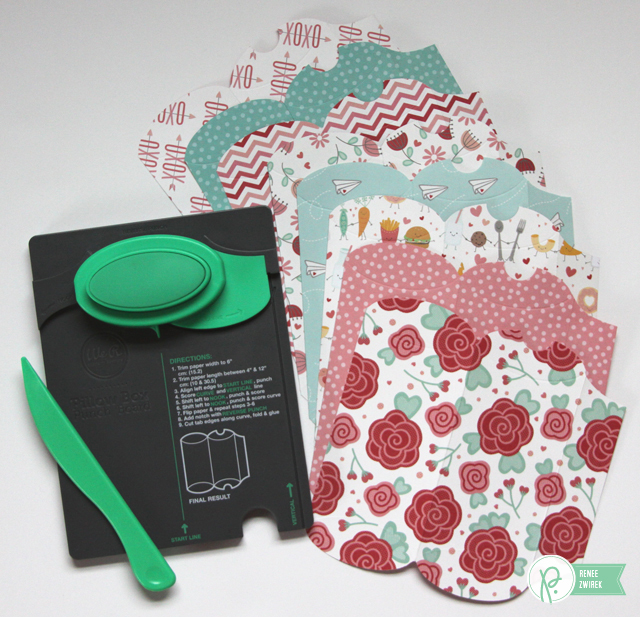 Aren’t those epoxy phrase stickers sooo cute?! This embellished Valentine’s Canvas was a simple project to make and shows how easy it is to incorporate Pebbles Inc We Go Together stickers into your Valentine’s DIY decor. 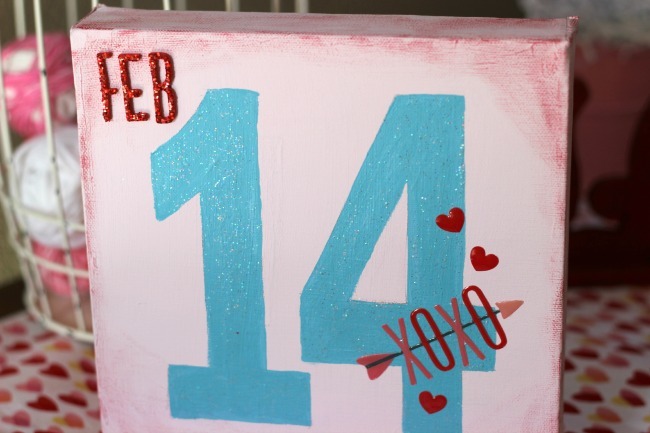 You can see how I painted this Valentine’s Canvas with Americana Chalky Finish paints on my blog Ribbons & Glue. Hi everyone! 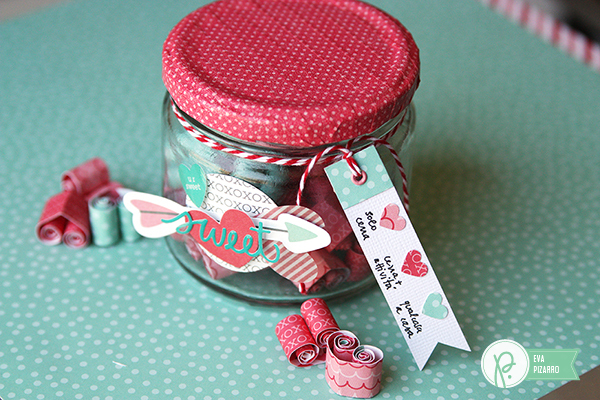 I’m Eva Pizarro and today I will show you how to make a cute date jar with the We go together collection from Pebbles. Me and my husband often want to do something fun in the evenings but we never know what to do! 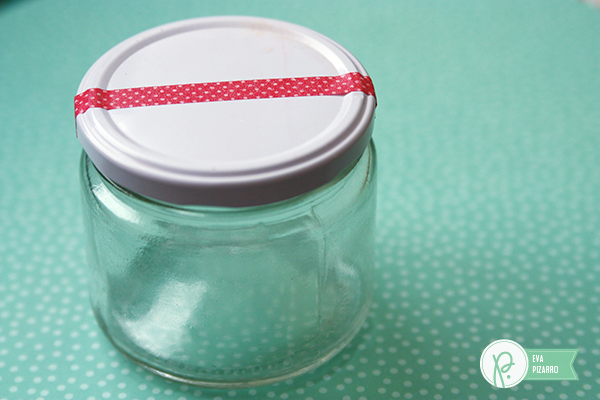 this jar is full of ideas and the best part is that you can put all the thing you would like to do together. The first thing you have to do is cover the lid. 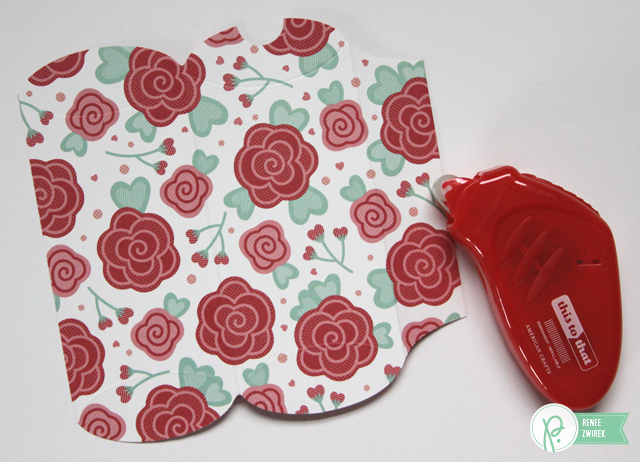 I used some red washi tape, but you can paint it or maybe use some permanent ink. 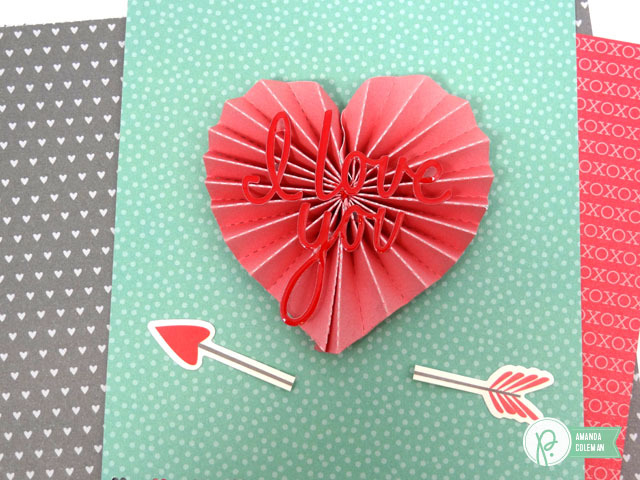 To do the quilling hearts cut 6 inch long strips of paper and write what you want on the inside. Bend them in half and curl the edges inside until you reach the middle section. 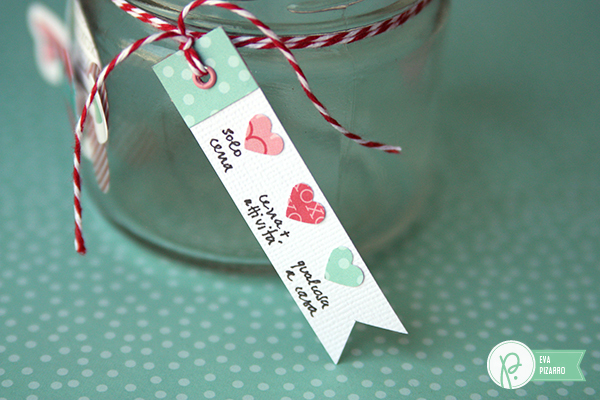 Decorate your jar and include a tag with a legend. I used pink strips for dinner ideas, red for dinner plus an activity and teal for stay at home dates. Hello! 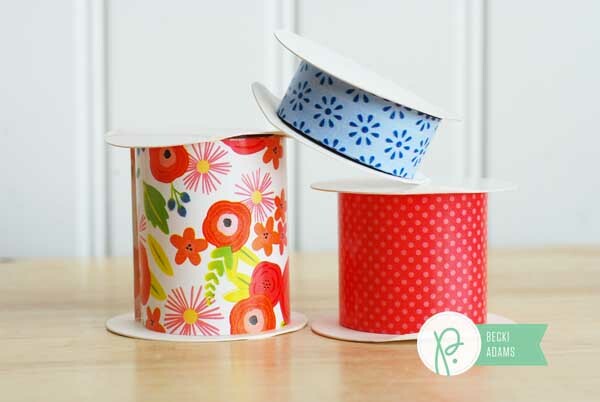 Renee here today to share another “gifts for teachers” project for the upcoming holiday. As you may have seen by now, I love giving handmade gifts for my girls’ teachers. Even more, I love preparing my “gifts for teachers” about a month in advance so I have no worries and there’s no rushing to have something ready last minute. 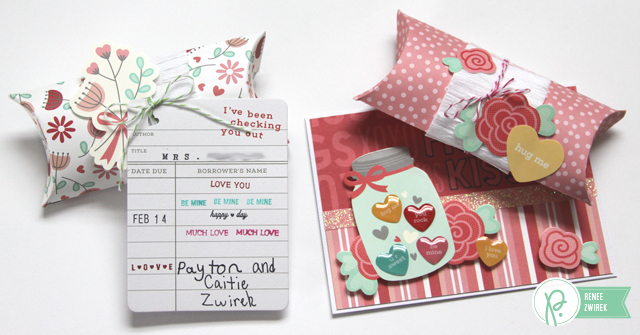 I used the adorable We Go Together line and the awesome We R Memory Keepers Pillow Box Punch Board to put together these Valentine’s Day pillow treat boxes for the teachers. I started by trimming my 12 x 12 pattern papers down to 6 x 6 inches. 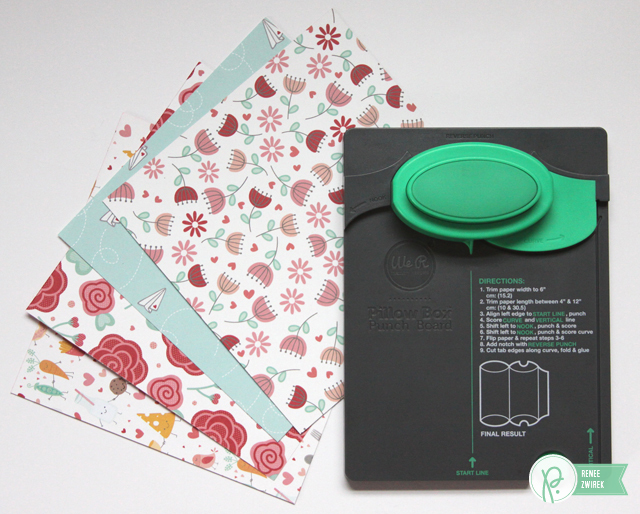 You can easily use the We Go Together 6 x 6 Paper Pad. I wanted the designs to be larger on these pillow boxes, so I used my 12 x 12 inch papers. 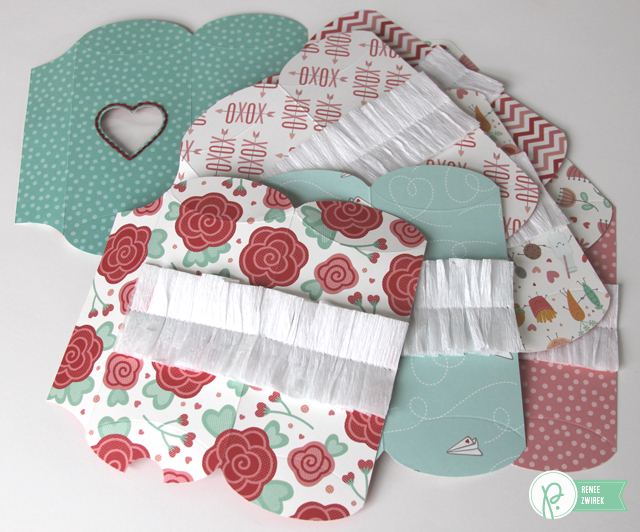 I used the We R Memory Keepers Pillow Box Punch Board for these gifts. Love how easy it is to use. I just followed the instructions and it took me about 15 minutes to get these 8 pillow boxes punched out. Hold on. I couldn’t just add my adhesive and close them up just yet. …but this one. For Payton’s teacher, I couldn’t add pretty ruffles. I wanted him to have something different and fun. So, I punched out this heart shape, placed a cut piece of a clear baggie underneath, and added red embroidery floss and stitched around the studded part of the heart. Such a cute little window. Now, he’ll see the Twizzler Bites candies (his fave) that we will add inside. Okay, now these are ready for the adhesive. 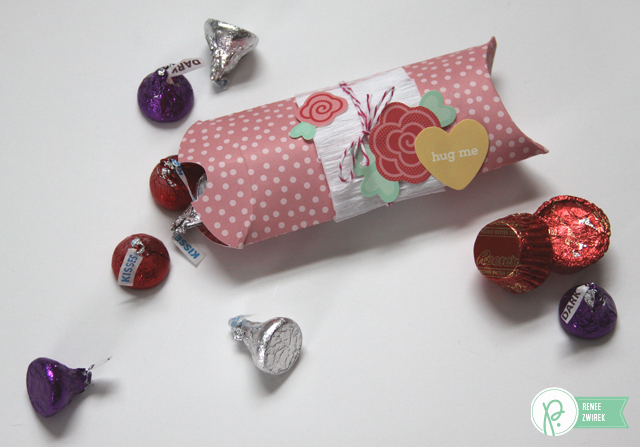 I added favorite candies to each of these pillow boxes. I also added adorable stickers to decorate each pillow box. 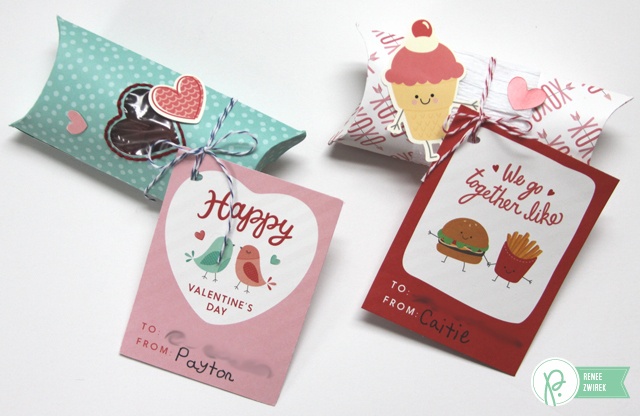 I trimmed the Valentine cards from the We Go Together pattern paper, used a heart hand punch at the corners of the cards, and tied the cards to each pillow box. These gifts are ready to give to the teachers. 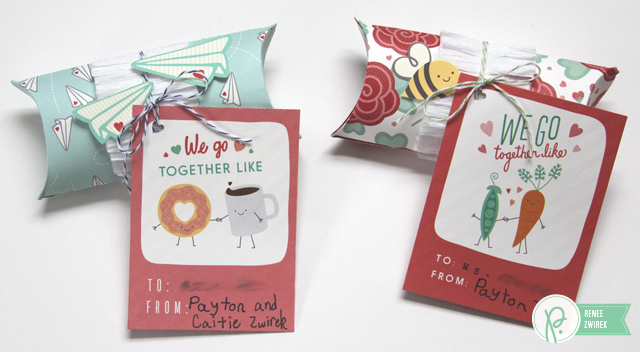 Here are the Valentine gifts for Caitie and Payton’s teachers. 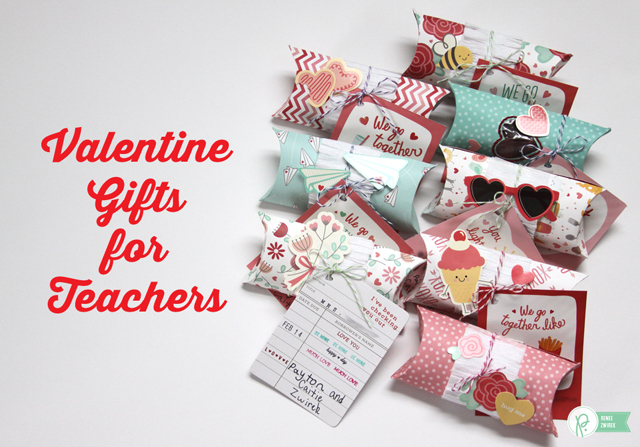 Here are the Valentine gifts for their gym and art teachers. Here are the Valentine gifts for their music teacher and Payton’s new reading teacher. 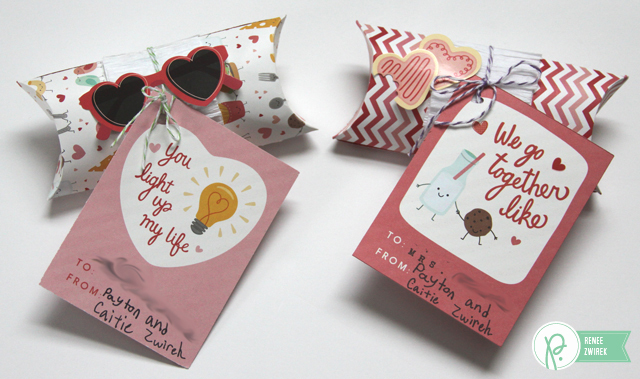 Here are the Valentine gifts for their library/computer teacher (how fun is that library card?!) and Payton’s previous reading teacher. I made a treat and card for this teacher, because her birthday is on Valentine’s Day. Very exciting! I wanted to mention that these pillow boxes measure about 2 1/4″ x 5″. I can fit 12 Hershey Kisses, or 6 Reese’s Peanut Butter Cup Miniatures, or a small handful of Twizzler Bites candies into them. So, they may look small, but I feel they hold a nice amount of candy in them. You can always make them larger if you like. 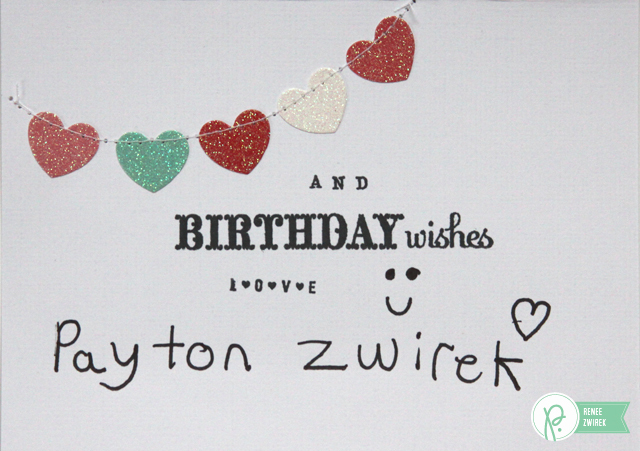 Here is the Valentine’s Day Birthday card for Payton’s previous reading teacher. I used an A2 Card & Envelope for the base of my card. 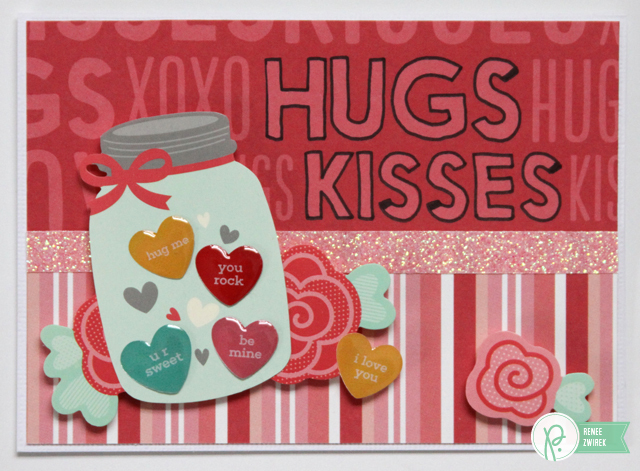 I outlined the “Hugs” and “Kisses” words from the Hugs & Kisses pattern paper. 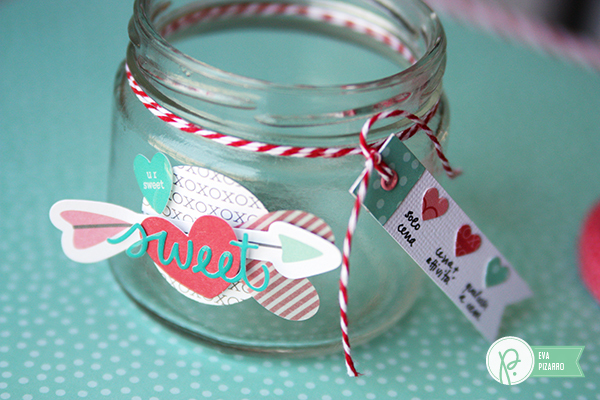 I loved adding the epoxy candy heart stickers to the jar of hearts sticker. So sweet! 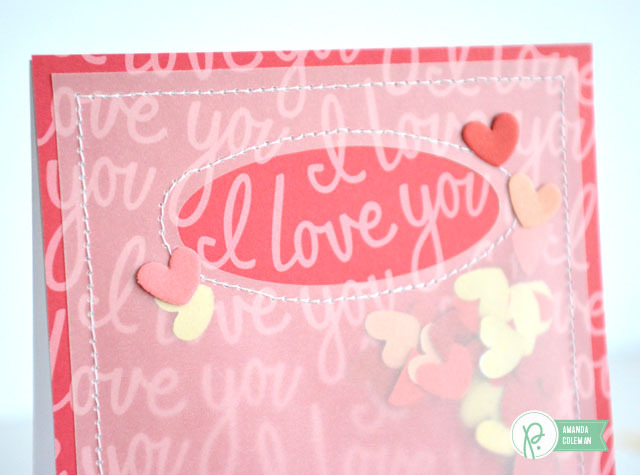 On the inside of the card, I added a machine stitched heart glitter stickers banner along with a stamped sentiment. 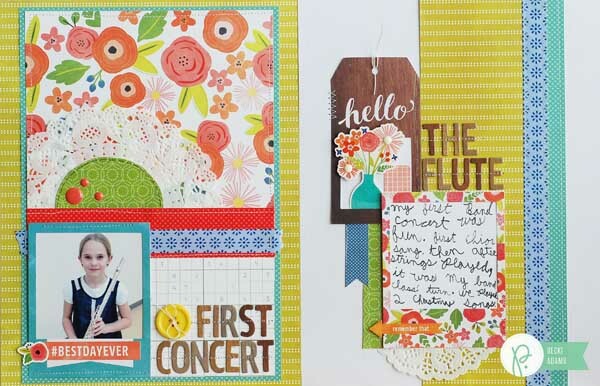 Hi there, it’s Becki here, to share with you a layout I created using the Happy Day collection. Even more specifically how I used the paper ribbon as borders on my two page layout. I love that this collection is so oriented towards the laid back aspect of family life. By far my favorite element of this collection is the paper ribbon. I love adding borders to my projects and this makes it so easy and so fun. 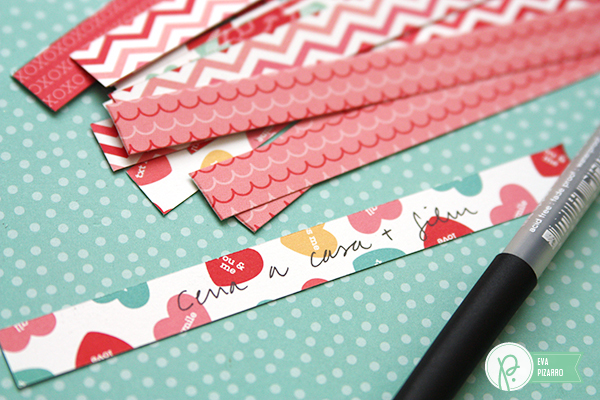 This paper ribbon feels like adding a little strip of wrapping paper to my projects. See, aren’t they adorable?!? 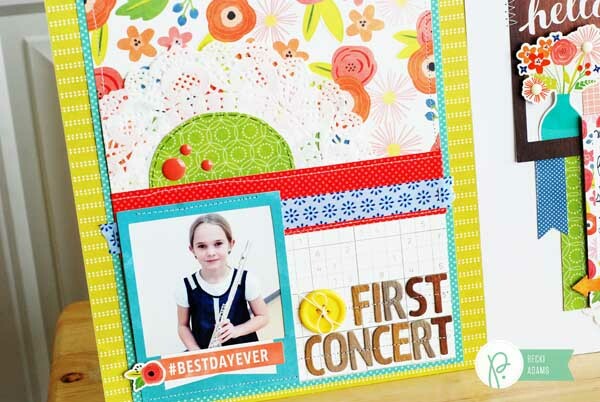 The layout I created is about my daughter’s first band concert. She recently started playing the flute and was so excited for her concert debut. Because she was so excited I thought that it would be fun for her to do the journaling too. I gave her a piece of white cardstock and a pen. I love that this layout (8 /12 x 11, double page spread) captures her photo and her handwriting at the same time. 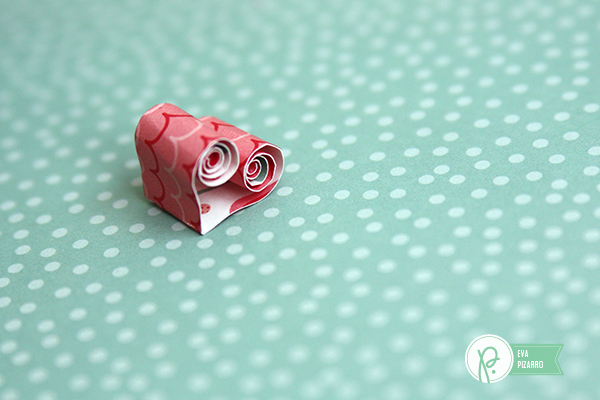 As you can see I used the paper ribbon in a couple of places on both sides of the layout. On the left hand side I created a border by layering two paper ribbons above the photo. I stitched down the bottom layer for an added layer of dimension. On the right hand side of the two page spread you’ll notice that I added a vertical border this time. 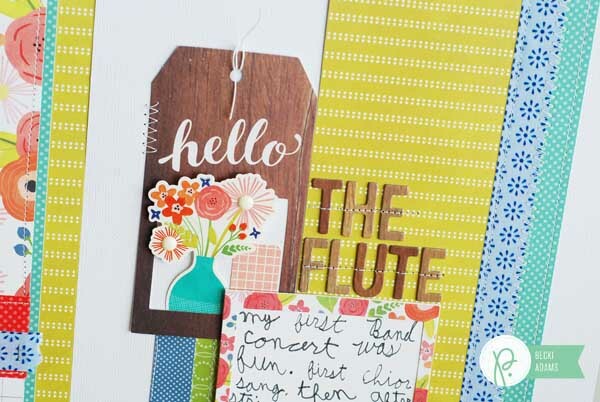 I used the same blue paper ribbon on both sides of the spread to balance the layouts and make them come together. I also added machine stitching on the ribbon. On one side I used a zig zag stitch and on the other side I added a straight stitch. Here are a few more details of the layout. 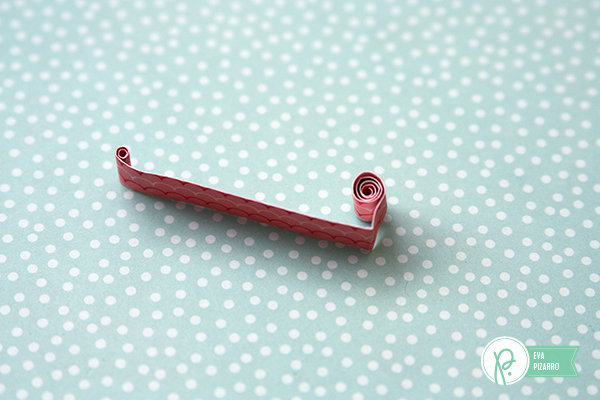 I hope you’ll add some paper ribbon as a border on your next project. They’re so fun and so easy to use! Thanks for visiting the Pebbles blog today! 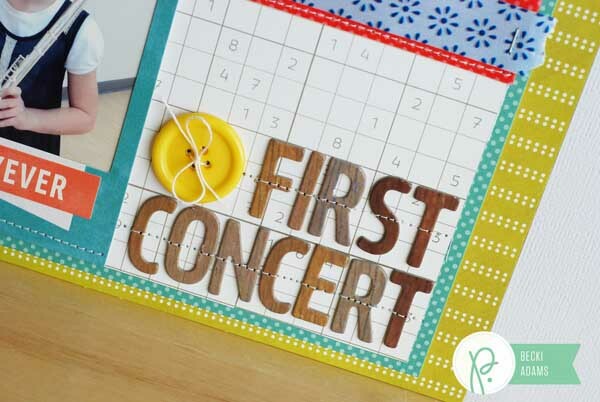 Amanda here today with one of my favorite ways to finish a card. Second only to Christmas, Valentine’s Day is my favorite card holiday. It is so much fun to make and send a mailbox full of cards. I love adding stitching detail to cards. 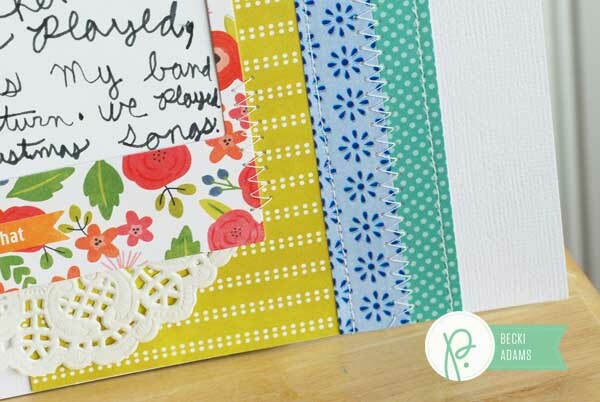 Stitching can be used functionally to hold cards together, as a design element, or as a decorative border. Pebbles’ new We Go Together collection has SO many fun embellishments. 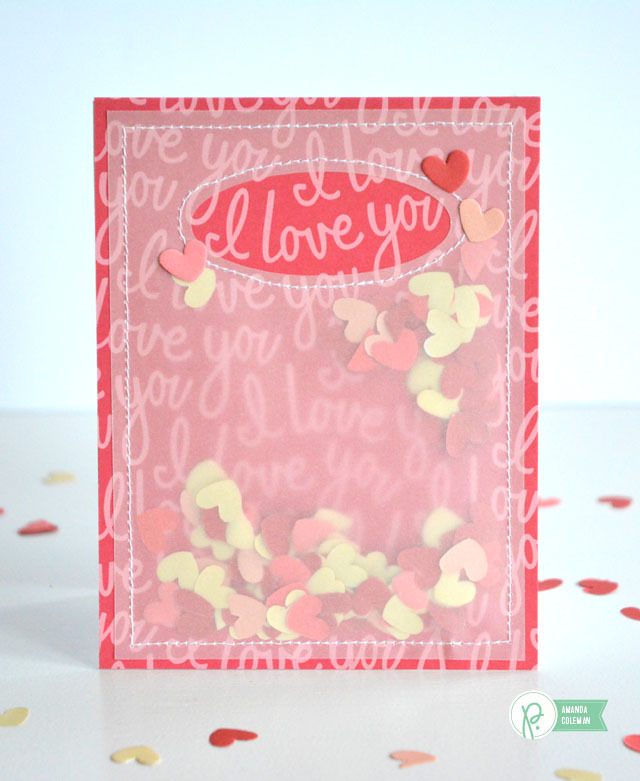 I used confetti, epoxy hearts and sentiments, accordion hearts, and library card pockets to embellish a variety of fun Valentines’s Day cards. I have a love/hate relationship with vellum. I love the way it looks on cards but hate the way adhesive shows through. 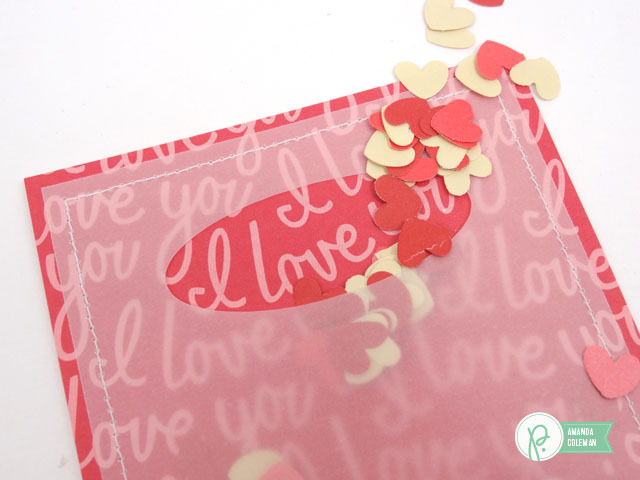 Where possible, I stitch vellum elements to cards which eliminates the need for unsightly adhesive. I created a vellum shaker card by stitching a panel of vellum to the front of this card. After a little bit of planning and measuring, I die cut an oval out of a sheet of vellum to highlight “I love you”. I created the shaker pocket by first stitching around the border of the vellum layer. 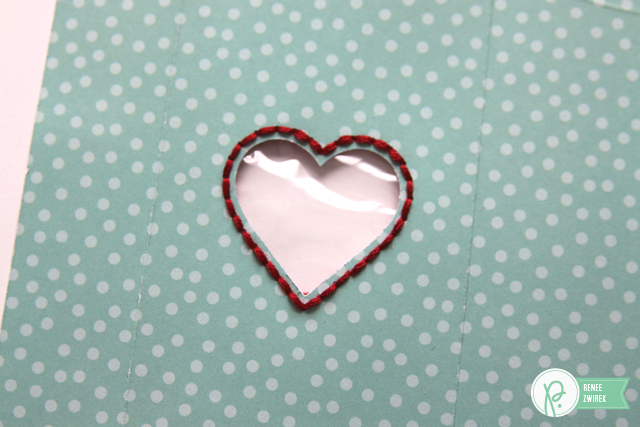 I inserted several pieces of heart confetti through the opening around the oval and then stitched around the oval. Sometimes adding a little bit of stitching can help balance the design elements on a card. After this card was finished, it felt as though it was missing something. 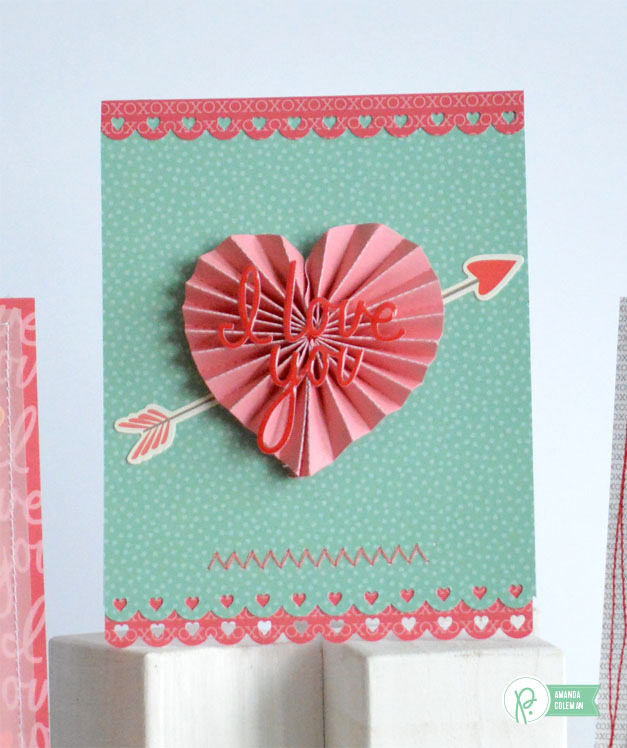 I added a bit of zigzag stitching near the bottom of the card to help balance the off-center accordion heart. To make the arrow sticker appear as though it is going all the way through the heart, I cut it in half and affixed each half to the card. Total card magic. 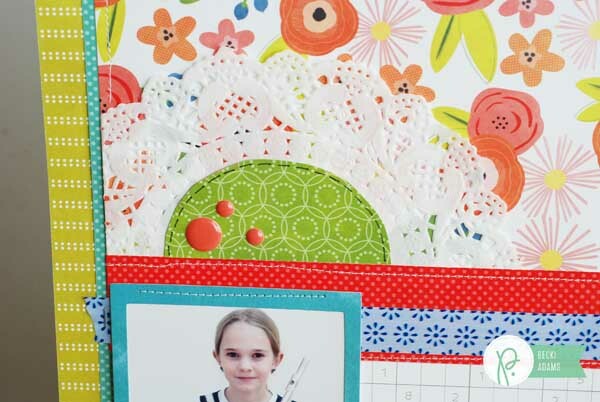 One of my favorite ways to embellish a card is to add a wonky stitched border. 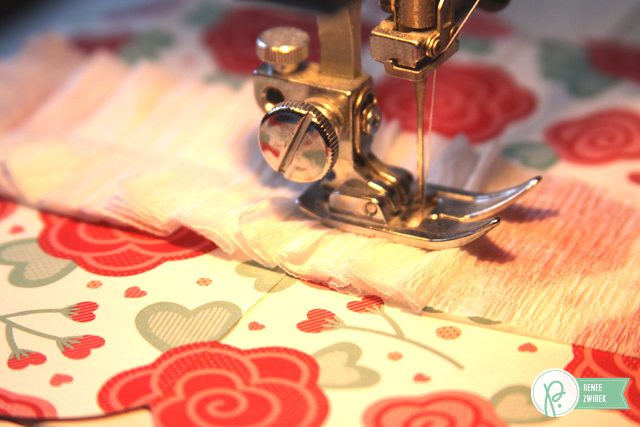 Simply move your card from side to side–ever so slightly–as you stitch around the card. Isn’t this library card pocket adorable? I love the “checking you out” sentiment. This card is perfect for my husband so I stuck with gray and red tones on this card to give it a more masculine feel. The library card pockets read “This book belongs to”, but I thought it was fitting for Valentine’s Day to cover the word “book” with an epoxy heart. 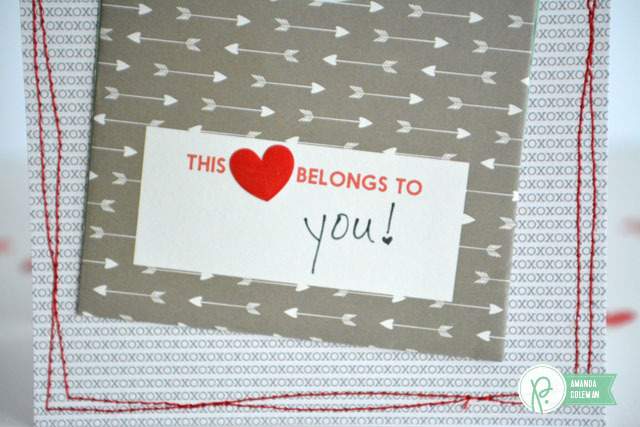 Personalize your valentine by adding the name of your recipient to the front of the library pocket.